Presidential aspirant of the African Action Congress (AAC), Omoyele Sowore has promised to increase the country’s minimum wage to N100,000 if he is elected in 2019. Civil servants in the country through Nigeria Labour Congress (NLC), Trade Union Congress (TUC) are currently demanding the 18,000 Naira minimum wage to be increased to 56000 Naira. The NLC claimed insincerity towards an increase in the minimum wage elapsed last month without government presenting a figure to the panel. But Sowore, who was addressing party supporters at a town hall meeting in Badagry said he will ensure an improved welfare package for civil servants should he emerge president of Nigeria in next year’s election. 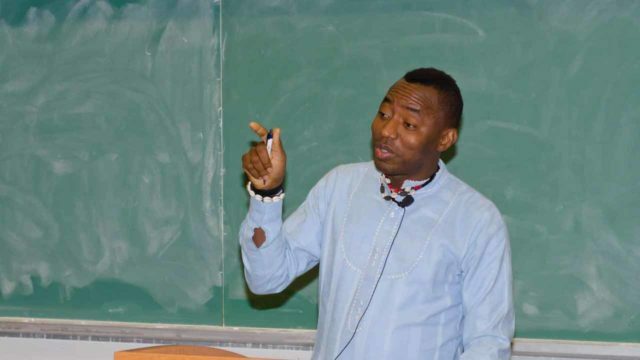 Sowore, who is the publisher of an online news platform, Sahara Reporters, revealed he joined politics to stop unemployment and intends creating 500,000 jobs yearly. He also promised to construct two expressways from Badagry to Lagos, and another one linking Badagry and Ogun State if elected into power in the 2019 general elections. Sowore, however, urged the voters not to sell their votes but instead they should vote wisely. “Can you do any business with N10,000? They will buy your card; your future is your PVC; keep it,” Sowore said.